I expected to just have one more post on the route to Beijing, but an unplanned day off has given me time to write about the latest 600km. After seven days trying to get our visas extended, James and I were finally on our way from Lanzhou, heading in the wrong direction! 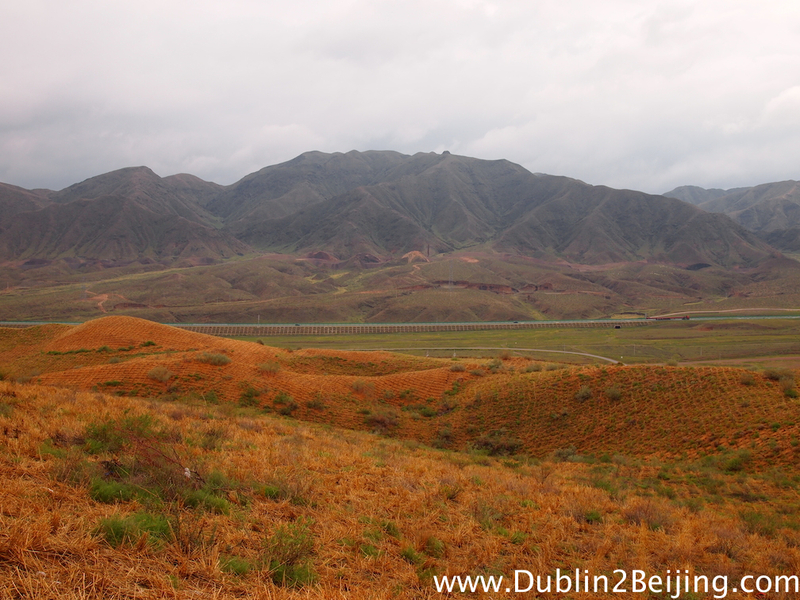 We’d taken a bus Eastwards from Wuwei to Lanzhou in a desperate bid to extend the visas, we were both determined to cycle every inch of this vast country so it was back to Wuwei. We’d spent three frustrating hours in the visa office that morning. After racing to the bus station for the 12:00pm bus, barging through the X-ray scanners and finally at the bus we hit a brick wall in the form of a rather nasty bus driver refusing to take the bikes unless we paid him 100 Yuan. The tickets only cost 64 Yuan, so we were having none of it. He met a grumpy pair of Westerners who were unwilling to budge. In fact, things got quite heated! This is one of those Chinese oddities. 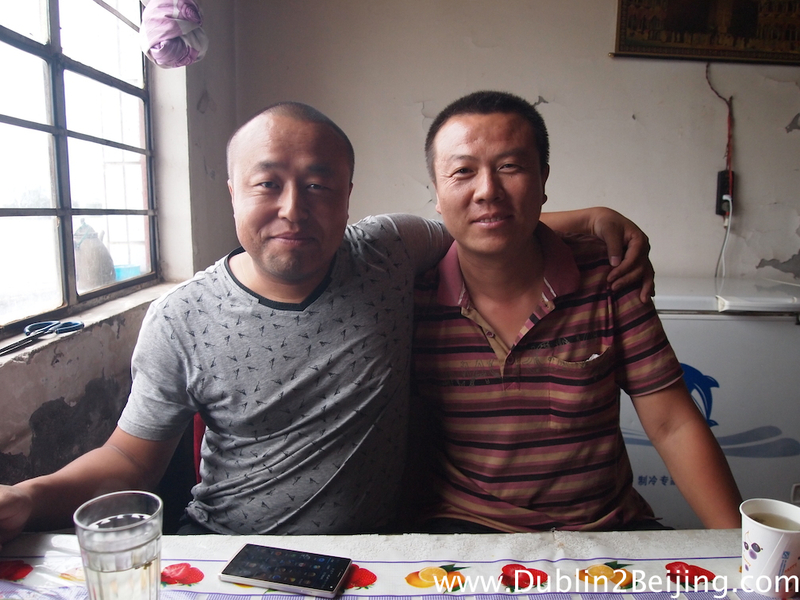 After we’d haggled aggressively and agreed on 50 Yuan he was all smiles. Certainly not something I’m used to. After the five hour bus journey it was too late to start cycling so we headed back to the hotel we’d spent three nights in before only to be refused! We argued that we’d been there last week, had fresh visas etc… and they examined the visas closely. Then they managed to tell us “we are full”. GGRRRR!!!! Communication breakdown! It was third time lucky and into a cheap place with WiFi. Starving and dehydrated from the bus journey it was off to KFC for the last supper for James and I were to go our separate ways the next day. James and I were sad to be parting on such a low. The visa extension was a costly example of what the bureaucracy in the countries I’ve gone through can be like. For a select few it’s plain sailing, but I’m yet to meet anyone since crossing Turkey that hasn’t a visa story to tell. Anyway we had a last man hug and wished each other the best. It turns out we’d both need it for the weather had taken a serious turn for the worse – it was bucketing down rain and the wind was once again against me. Happy to have the visa sorted, not happy to be facing some awful awful weather! 40km out of Wuwei I stopped for noodles and sausage and was shivering inside the petrol station looking out the window with despair. I pressed on and wound up on a new road of perfect tarmac and no traffic. Checked the map and sure enough I was on some new highway that hadn’t opened. A couple of guys in a small lorry/pickup thing stopped and offered to put the bike on the back such was the bad weather. I refused and they gave me a melon, nice guys. After 40km on the fancy new road it, eh, stopped! Literally in the middle of nowhere. No roadworks, no people, no town. Nothing. Just a 40km stretch of perfect tarmac and nothing. Uh oh. The two lads were there having fallen foul of this mysterious road just as I had. The weather was utterly nasty. I hadn’t felt so cold and wet since Bulgaria. To make matters worse, my raincoat is no longer water proof so I was soaked through. 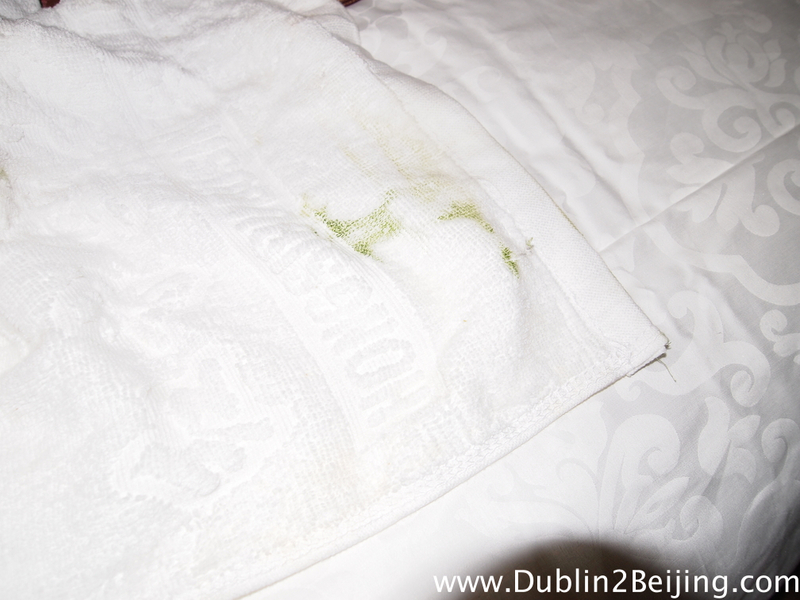 As if that wasn’t bad enough, being the genius that I am, I posted home my rain bottoms and shoe covers from Urumqi since I hadn’t used them in 3 months and was facing just desert until Beijing. What a stupid stupid move that was. I’ve regretted few decisions more than that particular error of judgement. So the two lads were insisting on me putting the bike on the back of their little van and I was still refusing. There was no hope of finding shelter from this weather. 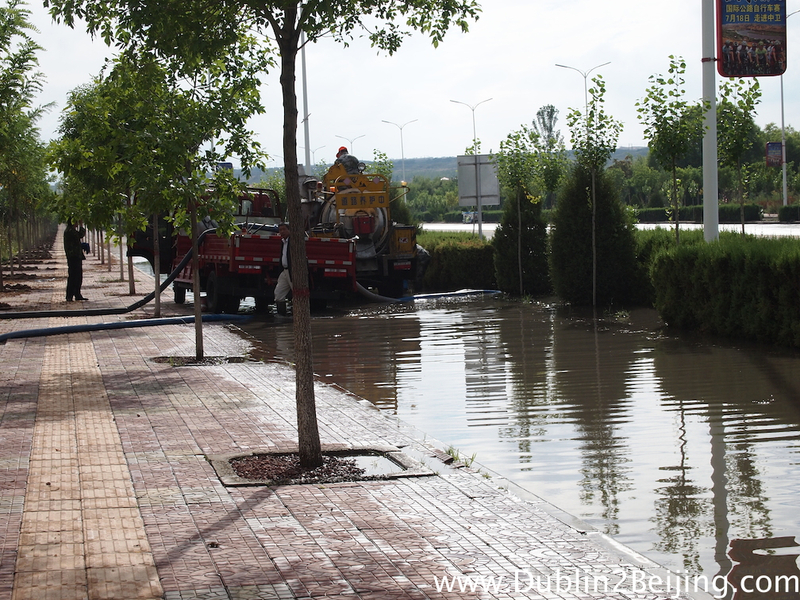 The pipes under the road were all flooded, and there wasn’t a town for 80km. I was shaking so much with the cold my arms were locking up. I pressed on a few km only to find the lads further down the road and they literally wouldn’t let me go! I relented. Despite my desire to cycle every inch of this country I was really in a pickle and really needed help. This weather couldn’t have happened in a worse area – from the next city onwards there were towns every 50-80km, just bad luck I guess. The van was an adventure in itself. There was only space for two small people up front and three of us were wedged in there. The guy in the middle had to put his legs around the gear stick so the other guy could change gears. With no common language they used Baidu (Chinese search engine) Translate to tell me I’m great and then they took a million photos of me. Then they brought me for dinner, paid for it and on we went. They drove past where I wanted to stay but I couldn’t quite communicate that I wanted to get out. I think one of them was insisting I stayed with him, so I said feck it, let’s see where this goes. On and on they drove, but they didn’t seem to know where they were going and stopped to ask for directions a couple of times. In China there are cameras every few km on the road and every time we approached one they’d do all they could to avoid being captured on tape. All sorts of tactics of going off road, driving on the wrong side of the road, slowing to a crawl etc… and in the van they’d turn their heads to avoid their faces being captured. I was wondering if maybe I’d set myself up with the wrong people – why were they hiding their faces?! On and on they drove, then turned South (I’m supposed to be heading East) and miles from the road I needed to be following. After 2 hours we arrived in a city and they pulled in pointed to a building and said “Binguain” (Hotel). I didn’t ask them to take me there, but sure enough I was outside a hotel. I thanked them, they took a load more photos and off they went. Then began the saga of trying to find a hotel in Jingtai. Jay-sus. I’ve been rejected less in Coppers on a Saturday night after 14 pints than this city. Every hotel I’d tried said no. I’d walk in and you’d swear I was infected with the plague the way the hands went up signifying a unanimous “NO”. I’d be sent back to places I tried before, then someone would come with me to try somewhere foreigners are supposed to be allowed. No joy. I tried 8 places and (I just realised the hotel was called “Super 8”, and 8 is a lucky number in China, what a coincidence!) got into a great room with WiFi and breakfast for only €13. I have never been so happy to be in a hotel. 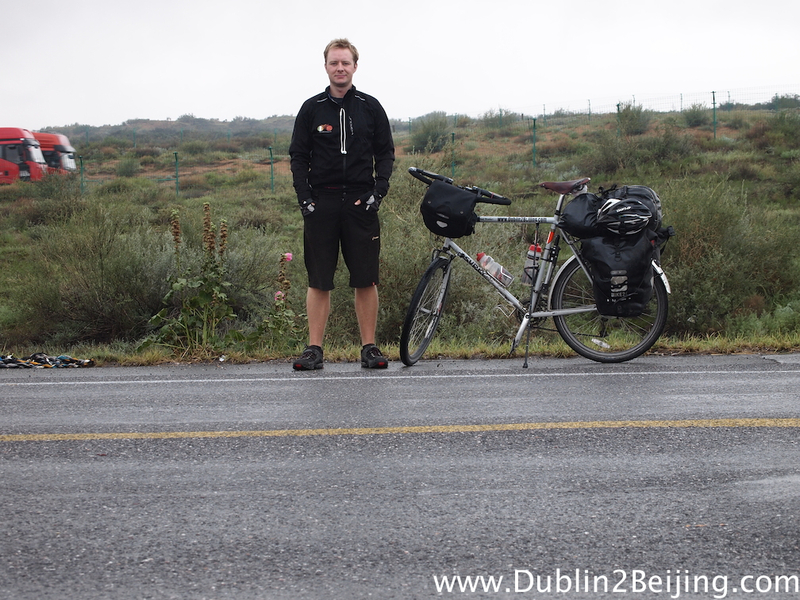 I was soaked to the bone, exhausted from both the cycling and the crazy journey in the van. 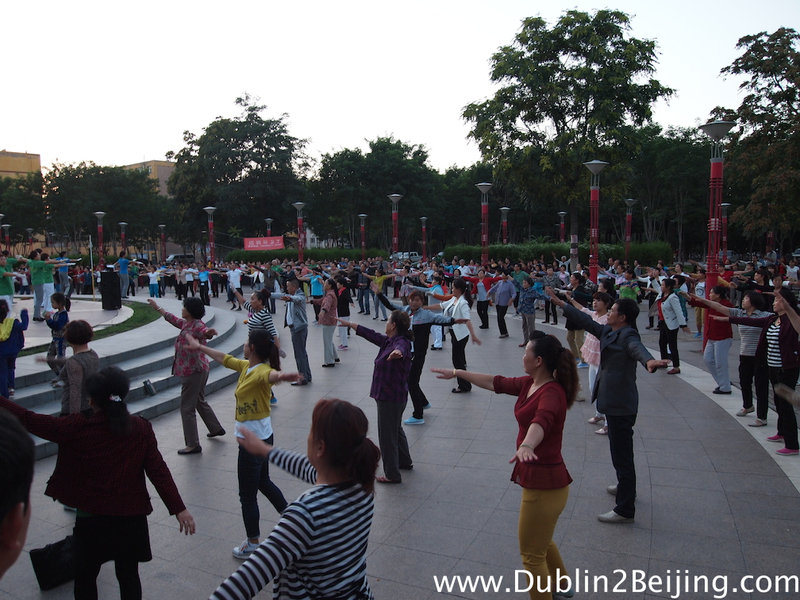 This was just the first day of the final stretch to Beijing! If this continued for the next 1500km I’d be wrecked, not to mention unable to write about it all! 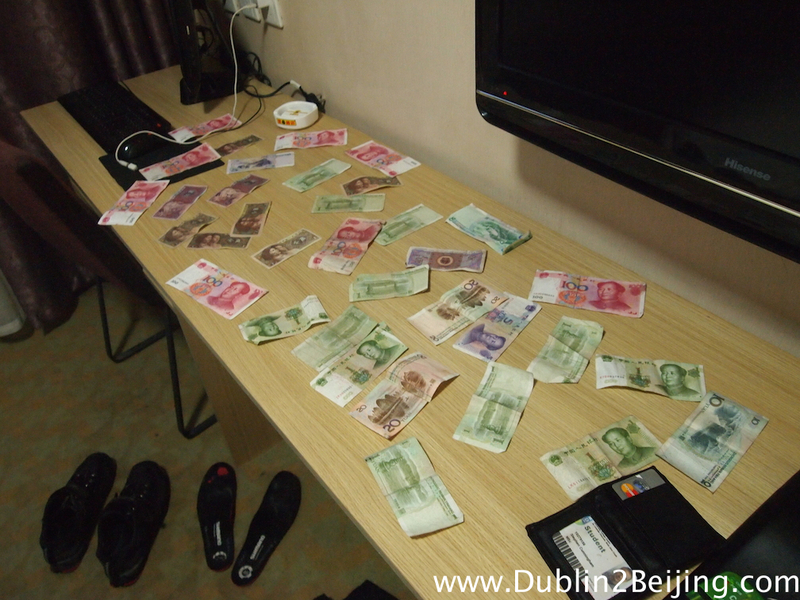 Drying out my wallet and its contents in the hotel. EVERYTHING was soaked through. The girl in the hotel put my payment out to dry for a while. Ridiculous. 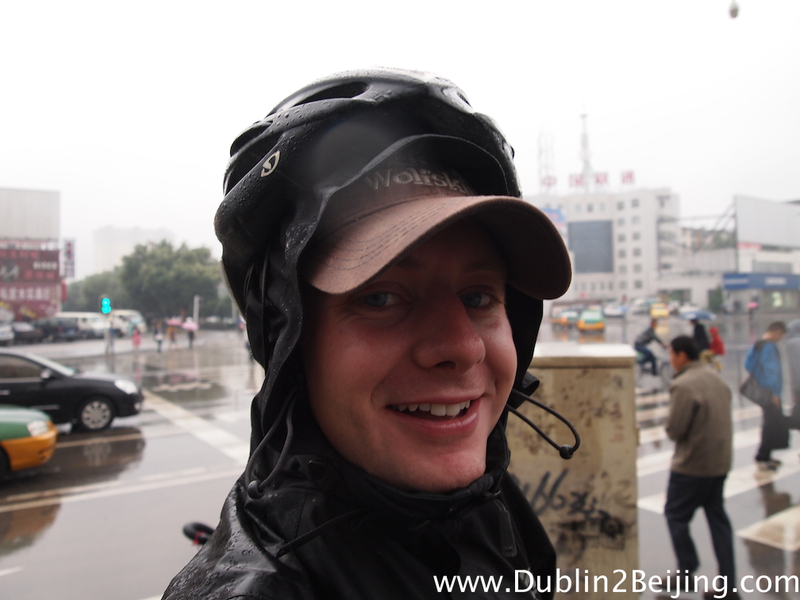 The next day I was tired but happy the rain had died off and hit the road heading for Zhongwei, 130km away. 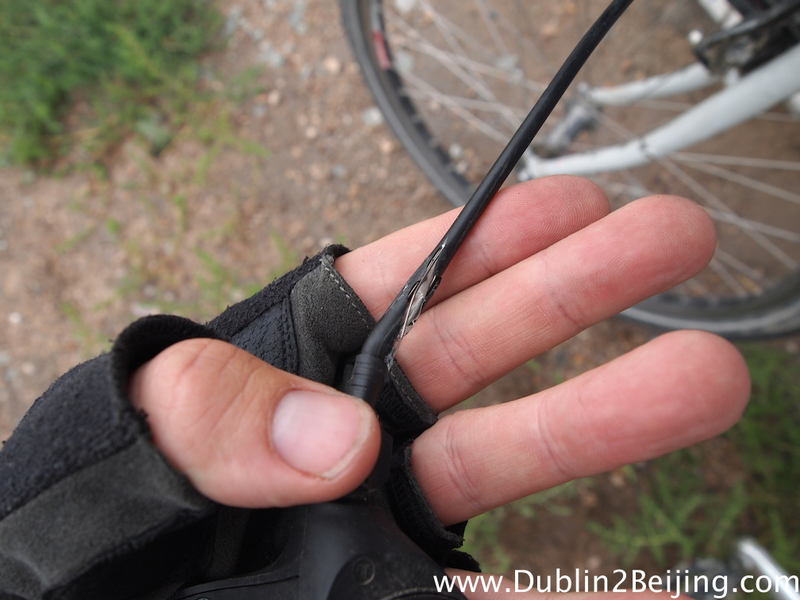 Just 20km into the day my front gear cable tore through the housing making shifting gear impossible. 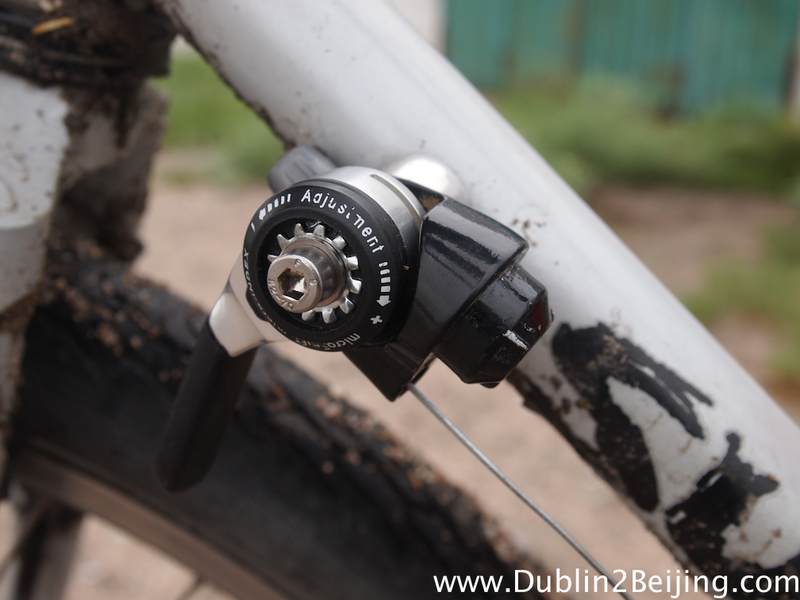 I changed my shifters in Bishkek for something more comfortable and had kept my old ones in case something broke. What good foresight! Without more cable housing I couldn’t fix the shifter but managed to bodge on my old shifter to the down tube and got it working again. Great success! 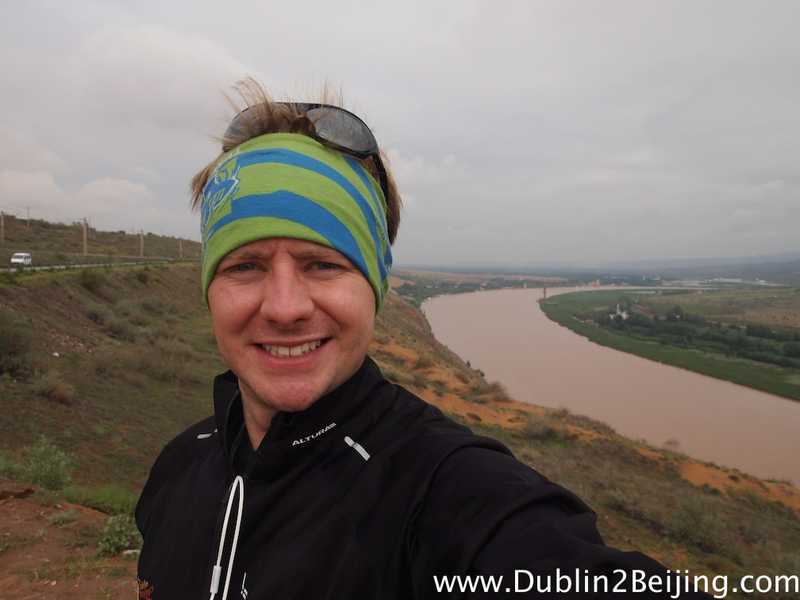 After that it was more cycling uphill along a seriously dull road into the “Great Wind of China” as I now call it. 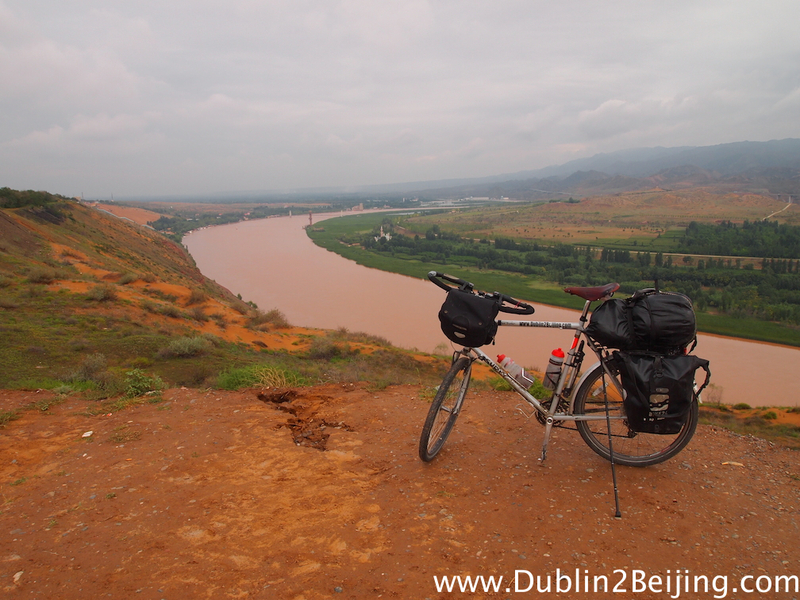 After 100km I was descending and came across the Yellow River, which was a fairly cool thing to see. It certainly perked me up. 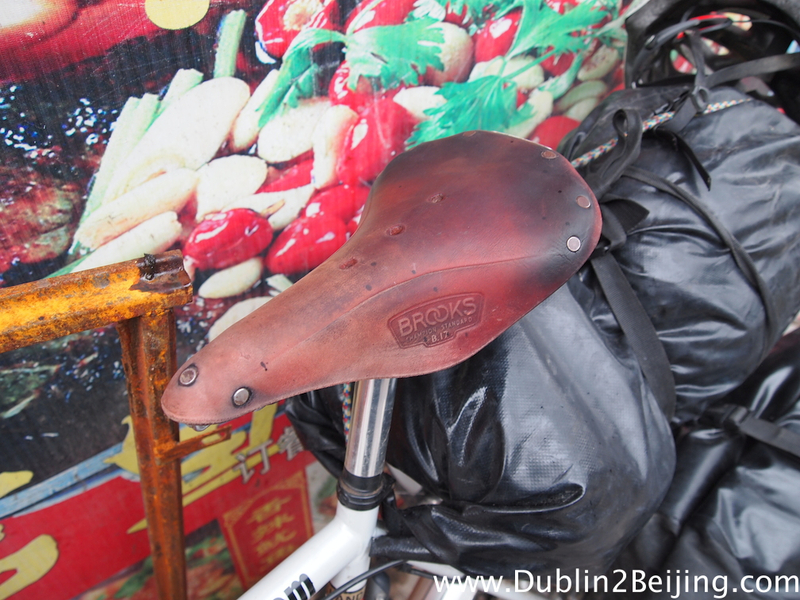 My wonderful Brooks saddle looking horrific after being out in the rain on the back of the van for a few hours. They should NOT look like this. My gear cable sheared through the outer housing so it couldn’t hold the gear in place. Disaster! Luckily I was able to improvise this nifty solution and it works quite well, although rather ugly and not too convenient for shifting. It works, that’s all that matters! 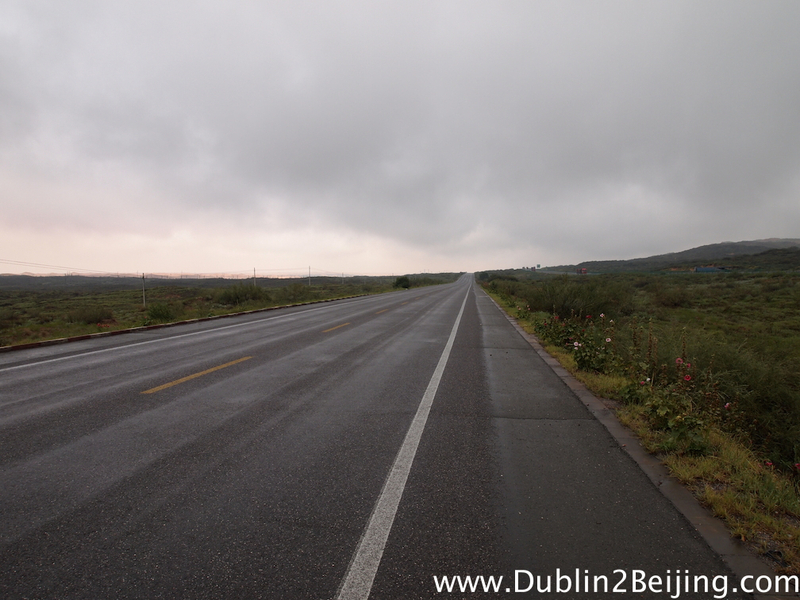 The long, dull and grey road to Zhongwei. Slightly uphill into the wind and weather. As I came into Zhongwei the effect of the rain was visible as much of the road was flooded and the water was being pumped into the river. At points it was a couple of feet deep – a few feet of rain fell in one day. Mad stuff. The decision to accept the lads’ help was verified and I felt better about it. Trying to camp in the bivi bag in that weather would’ve been too dangerous. Good stuff! Not looking overly happy in the dull weather, but at least it stopped raining! After the peak of the climb the scenery improved as the sun slowly crept through the clouds. The Yellow River appeared. Photo time! Smiling at least! Doing my pineapple hair thing again. 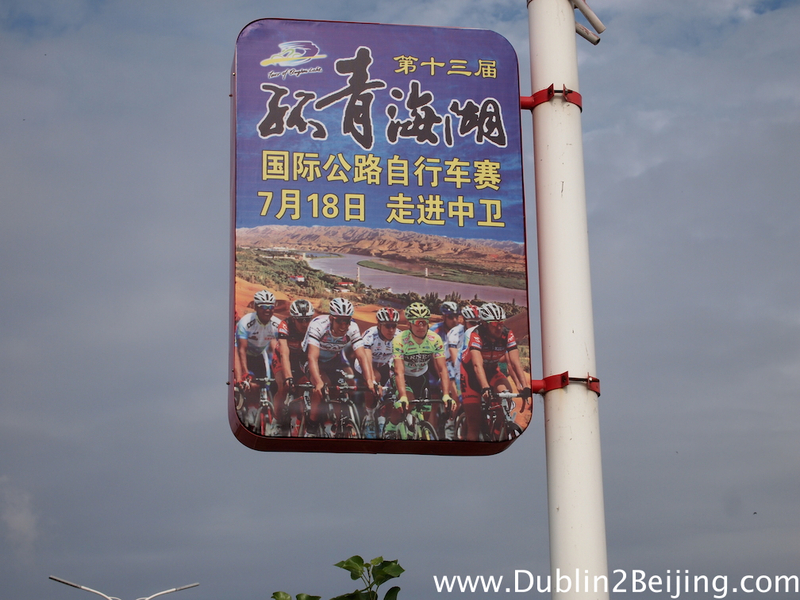 I loved the signs advertising a cycle race clearly using some stock racing photography. Not a Chinese face in the bunch! 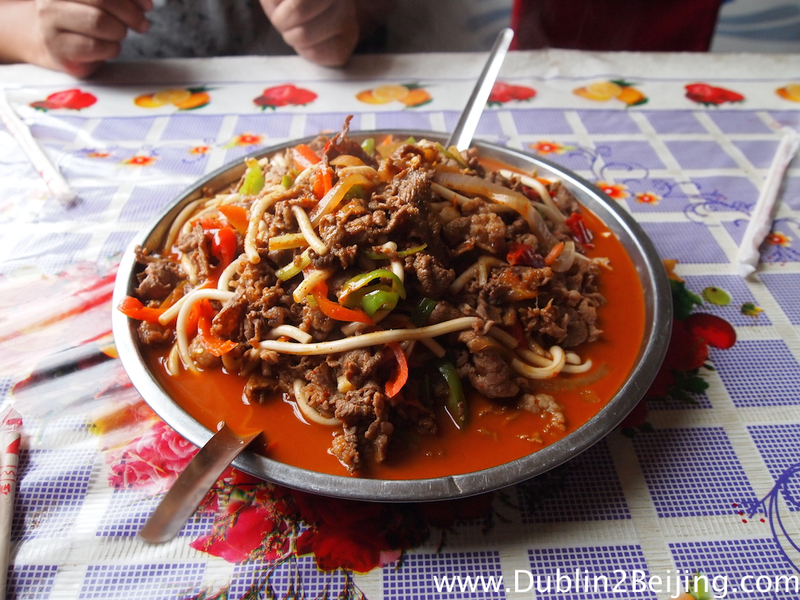 After the hassle of trying to find a hotel in Jingtai I was in no mood to repeat the experience and consulting the Lonely Planet guide was informed that only two hotels in Zhongwei accept foreigners, and the “nice” one was about €30 a night. Great! I didn’t care though and checked in after haggling a bit on price. It was a lovely hotel to be fair! There’s a massive Qing Dynasty temple in Zhongwei so I did some express tourism that night running around the temple taking some photos and having a million photos taken of me. Clearly few foreigners go to Zhongwei as I witnessed some serious jaw dropping. “What is it?” “I don’t know Jim, but it scares me” kinda looks. 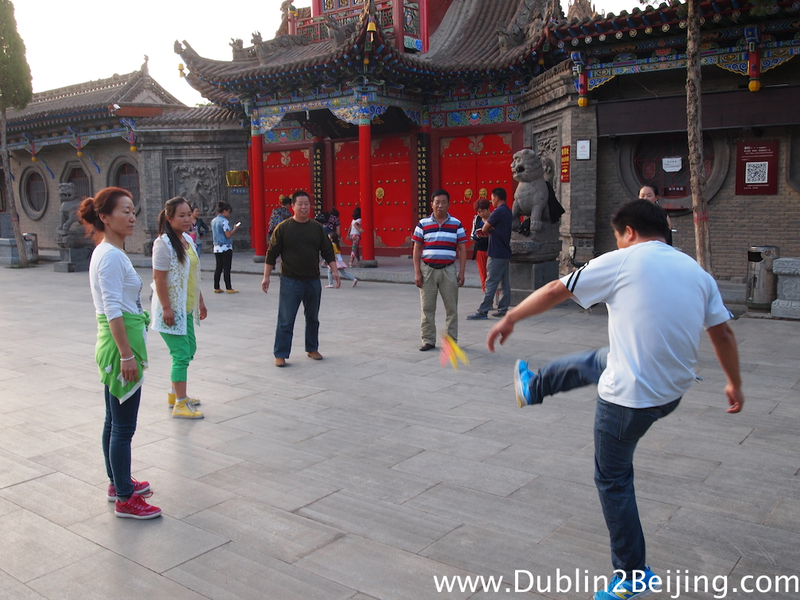 These guys were playing a kind of hacky sack outside Gao Temple in Zhongwei. It looked like good craic. Gao Temple in Zhongwei. Sadly I arrived after it closed but it was impressive even from outside. 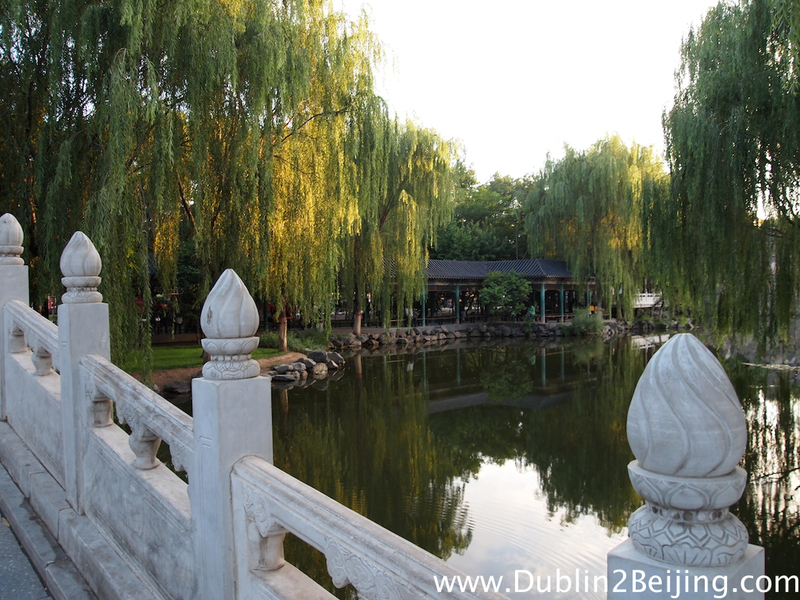 Gao Temple is set in some nice gardens. 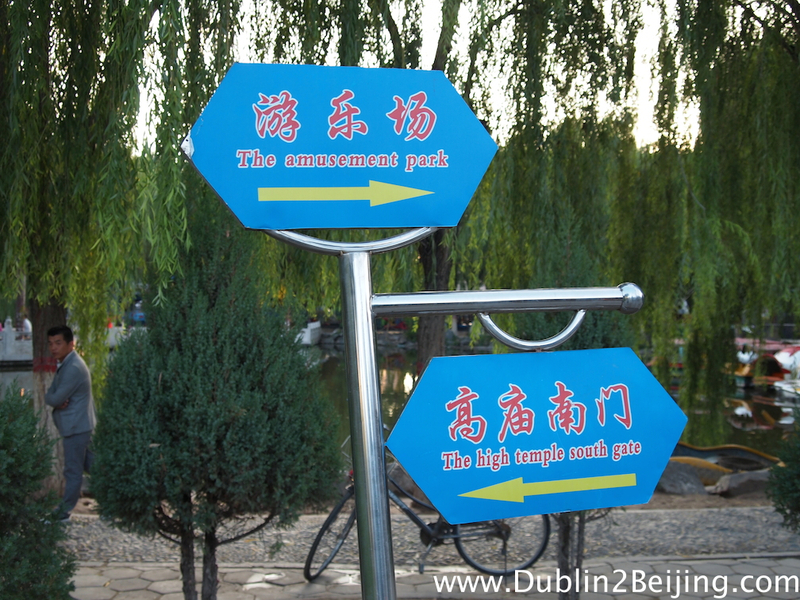 Aaaaannnndddd like any good Chinese tourist attraction/temple, it must have a feckin amusement park. Ugh. 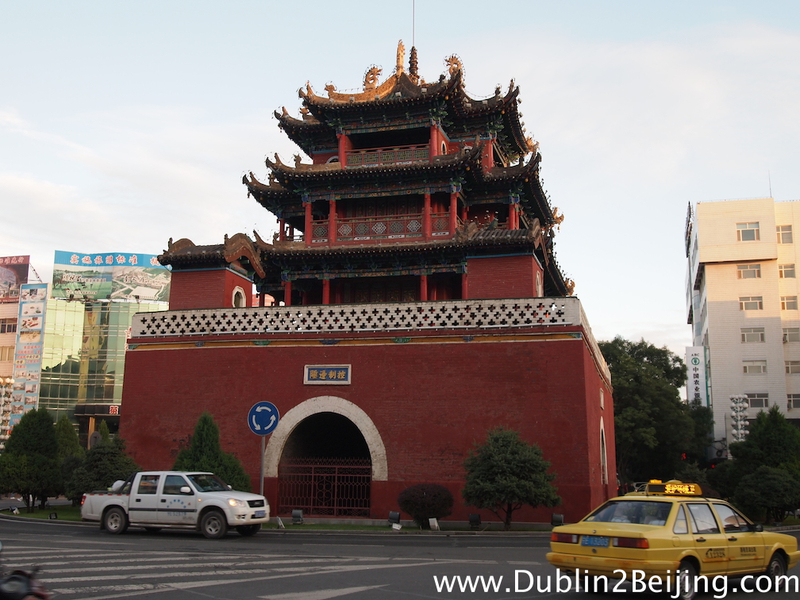 The Pagoda in the centre of Zhongwei. 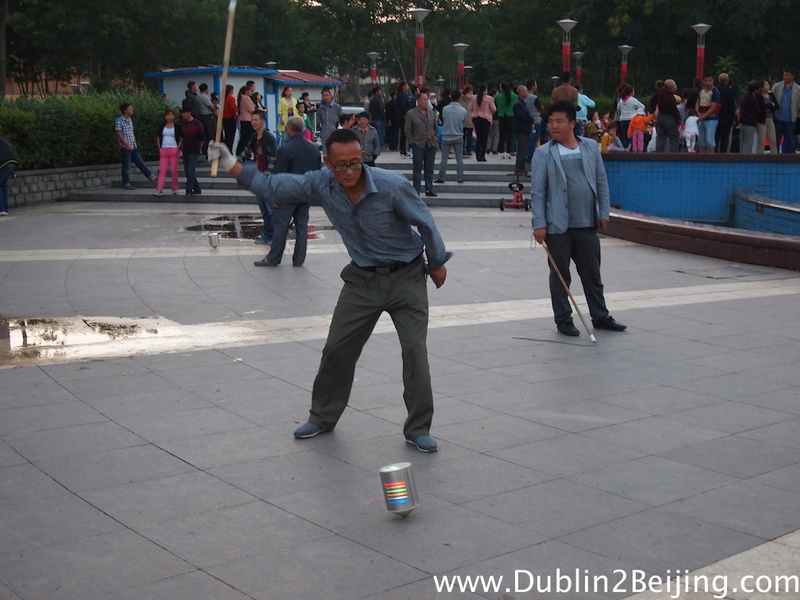 This was interesting – I thought fireworks were going off but it turned out it was about 100 guys smacking these spinning tops with ropes on the end of stick. They make a serious bang and about 100 people were doing it on a square. This guy was the best at it – some power in his whipping! Aaaannnndddd of course, group dancing on the street! Day 3 was fairly dull except for me stopping in a petrol station and doing my celebrity act whilst trying to eat noodles and processed sausage. I was reading The Hobbit and at times I feel a bit like Bilbo Baggins when someone doesn’t know what a Hobbit is – when I enter towns I get soooo many strange looks of “what is this interesting creature? how does it cycle a bike? Why are its eyes such a strange colour? And its hair, so odd”. When I took out my tablet to read in the petrol station the look of amazement on the attendants faces was unreal. “This odd creature can read…and it owns a tablet…what sorcery is this?!”. Honestly, I think E.T. could saunter through some of these cities and arouse less interest. Trying to occupy myself on the dull road. Long breaks in the hard shoulder reading and eating lunch. I pulled into Hongsibu and into a brand spanking new hotel. So new in fact that I was their first ever customer! I’d intended on going further that day but both my Achilles tendons were quite sore and I wanted to rest. Hongsibu is one of these new cities with no one around and nothing going on. I walked around and found nothing of interest except for a child visibly gasping when he saw me. In the morning the hotel was having its grand opening and the whole extended family was there in their Sunday best as I came downstairs in my lycra to pay and get the bike. The look of bewilderment on the old guys’ faces was priceless. Wish I’d taken a photo! That would be green mould from the bottom of my water bottle. Tip: Clean your water bottles once in a while! Yuk. The Grand Opening! I was their first customer! In fact, I’d say I was the first Westerner to come to Hongsibu. What a strange little place. From Hongsibu I pushed out a big 165km to Dingbian. 165km is a long long day. I try all sorts of mental tricks to get the distance done. Focus on getting to 50km, have a good break and read. Then do another 50. Then it’s just 3x20km stints. Anything really to pass the time. During one of the breaks I was reading whilst leaning against the barrier of the hard shoulder on the highway and the highway patrol stopped to tell me to get off it. I just stared at him blankly, played the dumb foreigner and offered him a cake. He gave up in despair! Hehehe. Actually getting onto the highway is one of the, shall I say, more interesting parts of the day lately – I try all sorts of tactics of hiding behind trucks/coaches as they go through the toll booths. Sometimes I’m caught, other times I get through with no problem. When they do see me I don’t look at them, and just cycle like a mad man and hope they won’t give chase! The highway is far safer than the secondary road so I prefer to be on it, despite it being the most boring form of cycling you could imagine. 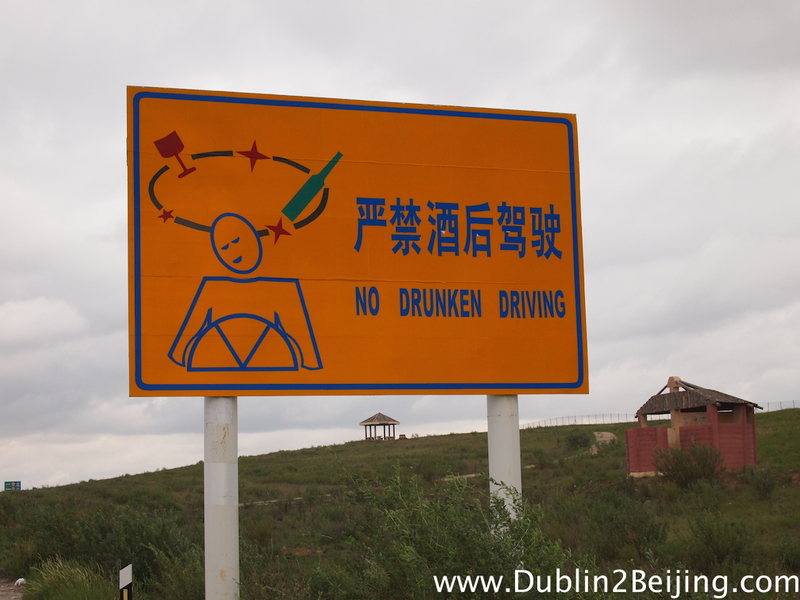 A funny sign. What’s not funny – the smell from the toilet on the right. It’s about 50m from the road and you can smell it from about 500m away. Lovely! 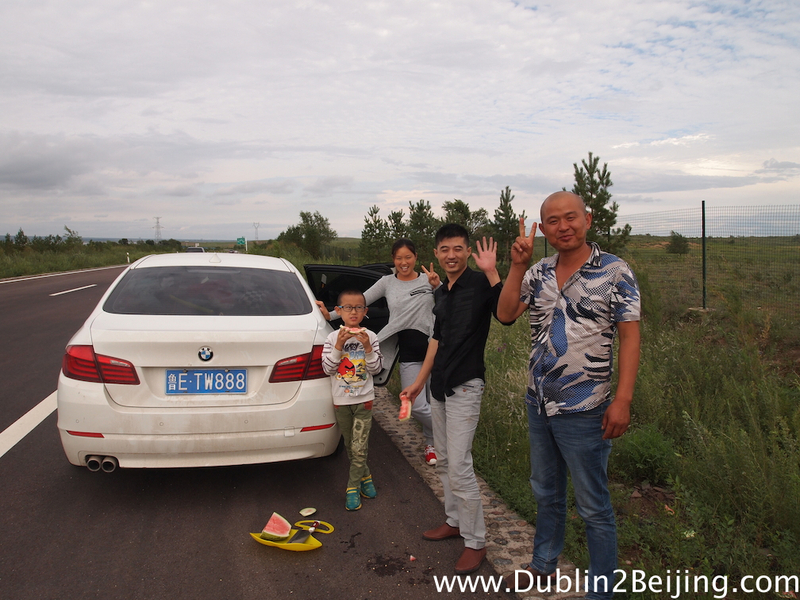 About 30km from Dingbian a family had stopped in the hard shoulder to eat water melon and they pulled me over to give me some – a well appreciated treat and they were really nice. Probably the first people I’ve had a substantial encounter with who didn’t ask for 20 photos with me. It was quite nice! Then Dingbian was insanely busy. Holy crap! it’s a small city on the map but incredibly busy. Just one hotel rejected me and I was in bed early enough, quite tired after the long day. My achilles tendon was really hurting and I contemplated a day off but decided against it. The family who gave me water melon at the side of the road. Nice guys. 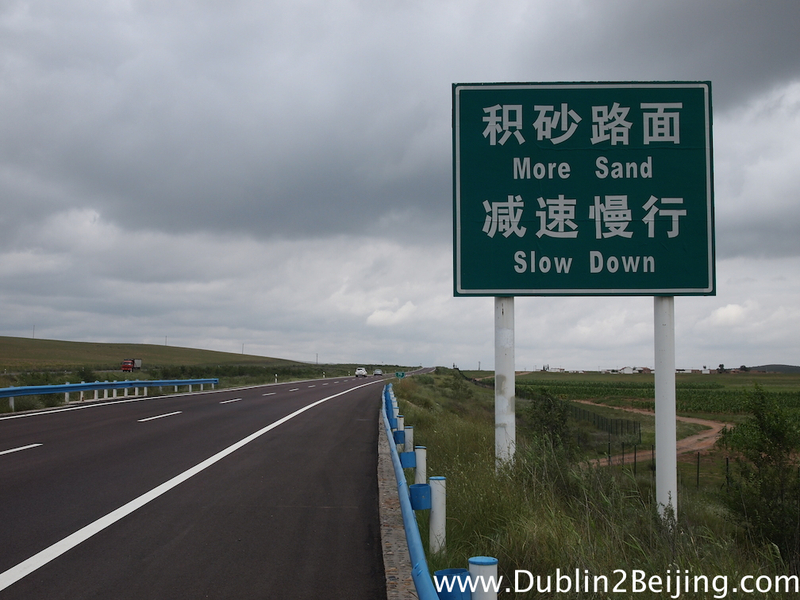 From Dingbian it was a 125km stretch of more petrol station breaks, reading and mental games. The legs were very heavy and sore, not to mention the achilles tendon. The 8 days off renewing the visas had allowed my fitness to drop off quite a lot and the heavy mileage was taking its toll. Also, returning to solo cycling after 2 months with James was quite tough too (miss you buddy!). I was starting to lose the rag with people when they were pestering me during breaks. When I was fixing my improvised gear shifter a kid pulled up and started do the Chinese thing of shouting Chinese at me despite me clearly not understanding. He was spitting pumpkin seed shells on the ground beside me, harping on in Chinese in my ear and I lost the plot and started screaming at him. I’m not proud of it, but I realised it was time for a day off! 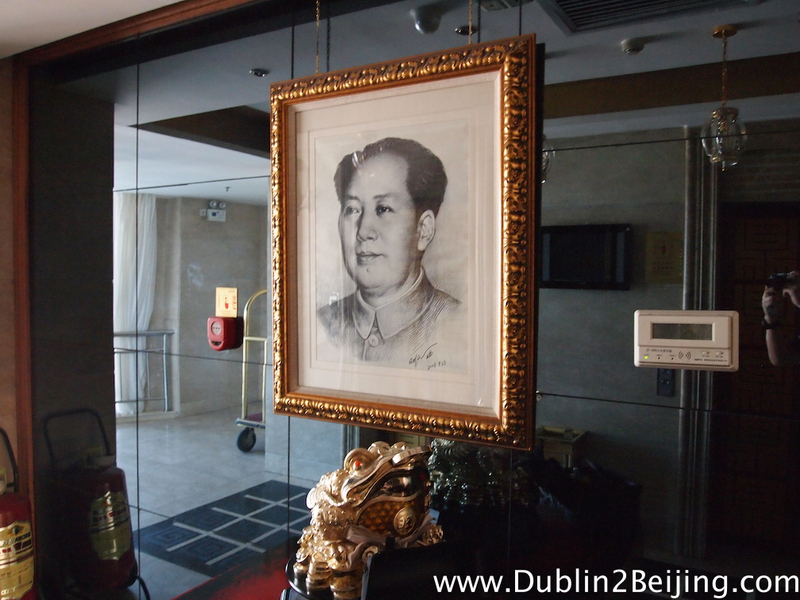 Yer man Mao, in the lobby of the hotel in Dingbian. 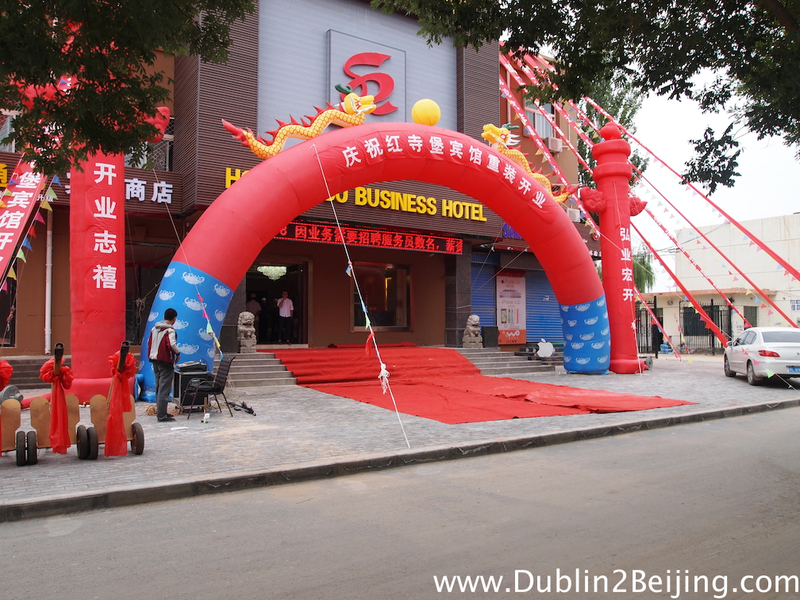 I arrived in Jingbian and into a budget chain hotel, checking in for two nights. 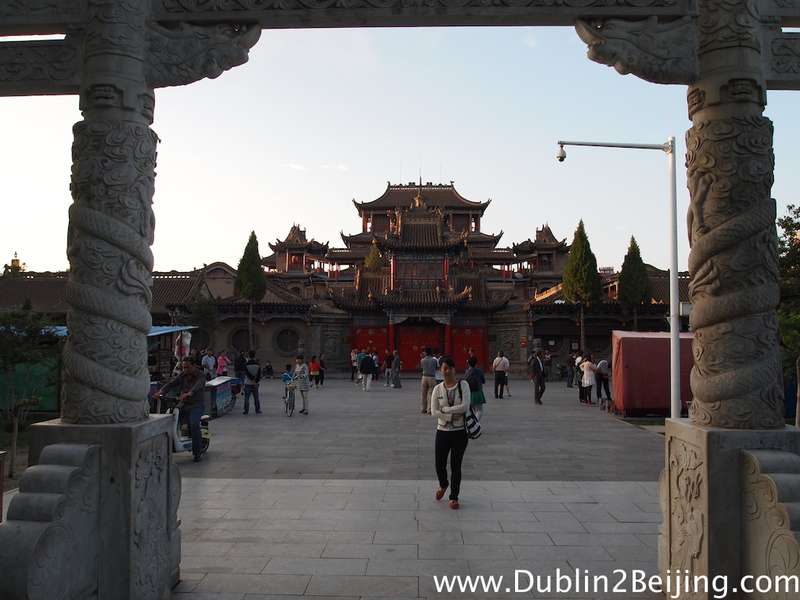 Jingbian is another huge city with nothing going on. It’s absolutely dead. That’s fine by me to be honest – I just wanted some downtime and to rest my mind and legs. 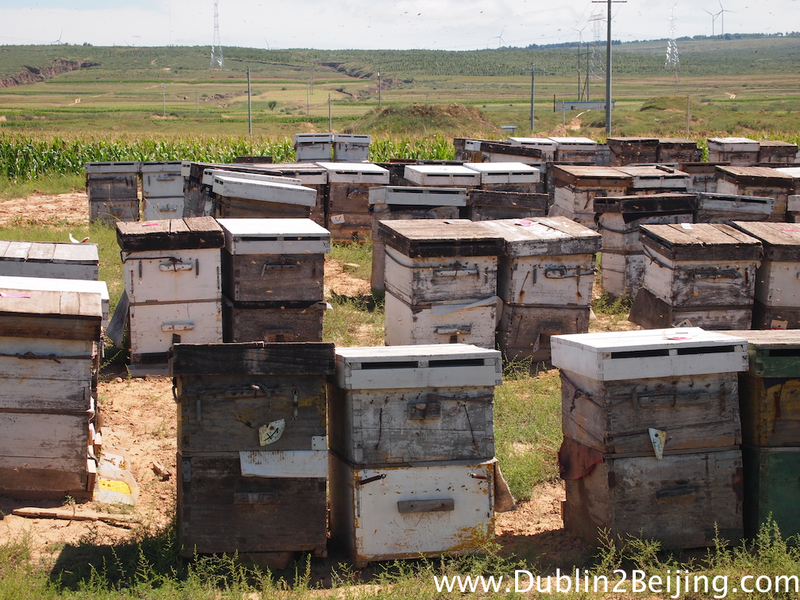 The road from Dingbian to Jingbian was honey country. Full of bee hives and sometimes I was surrounded by swarms of bees. No stings thankfully! It’s now 1000km to Beijing. About 8 days of cycling. This recent stretch has been incredibly boring except for the little adventure on the first day. Incredibly boring, and surprisingly difficult mentally. I guess I’m in wind down mode at this point, despite my best efforts to avoid that. 1000km is no small feat, particularly after the bones of 13000km! I was planning on doing the entire 1600km from Wuwei in one go but I’ve changed my mind and I’m taking a detour to Pingyao in 3 days’ time to see the ancient city there. 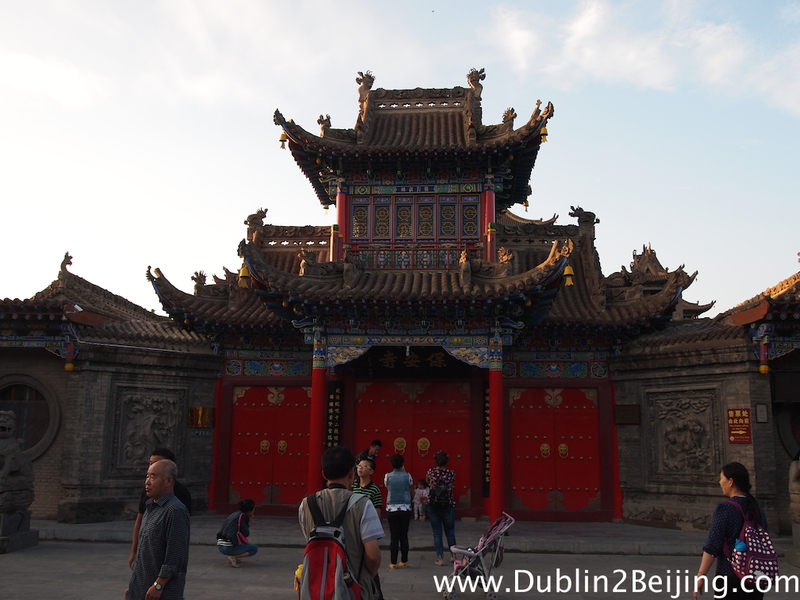 I’d like to be able to say I’ve seen something between Wuwei and Beijing, so Pingyao is it! I suppose the only slightly interesting part of the past week has been passing from Gansu province, through Ninxia and into Shaanxi. Ninxia is Muslim and home to the Hui people. For the first time since Kyrgyzstan I heard the call to prayer in the morning in Ninxia. 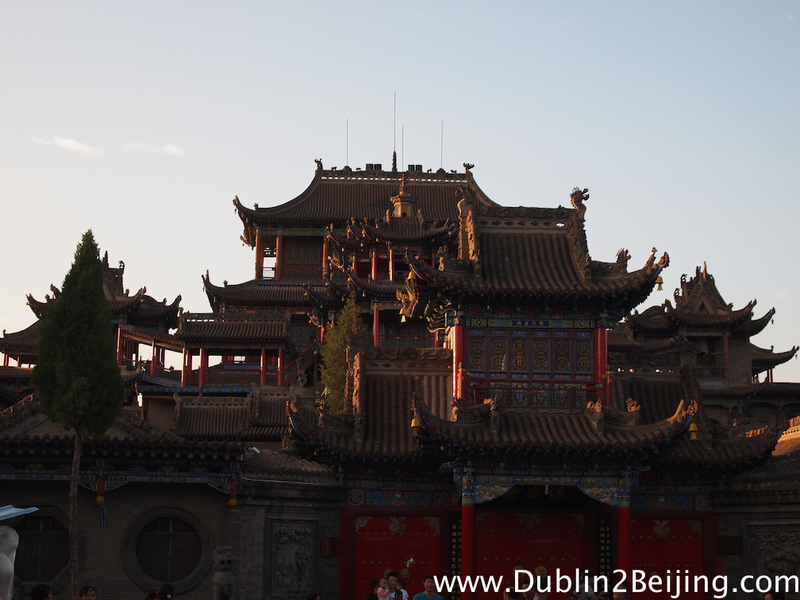 Then when I crossed into Shaanxi I noticed Catholic churches appearing and what’s more, bells ringing on the hour. It’s funny the things you notice! So, I enter my final week of cycling. 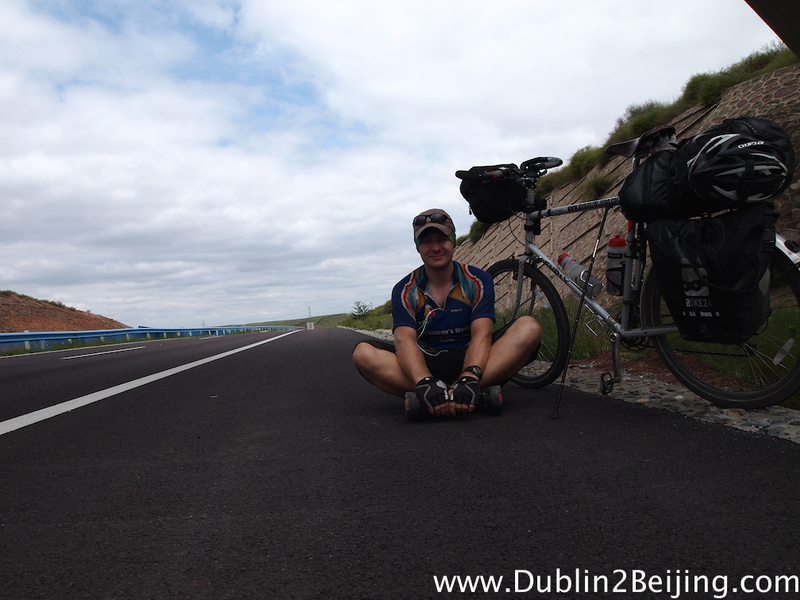 1000km is no small task, so I’m expecting to arrive in Beijing on Tuesday the 19th, depending on how the legs go. I have a day off in 3 days’ time and I’m looking forward to it already! 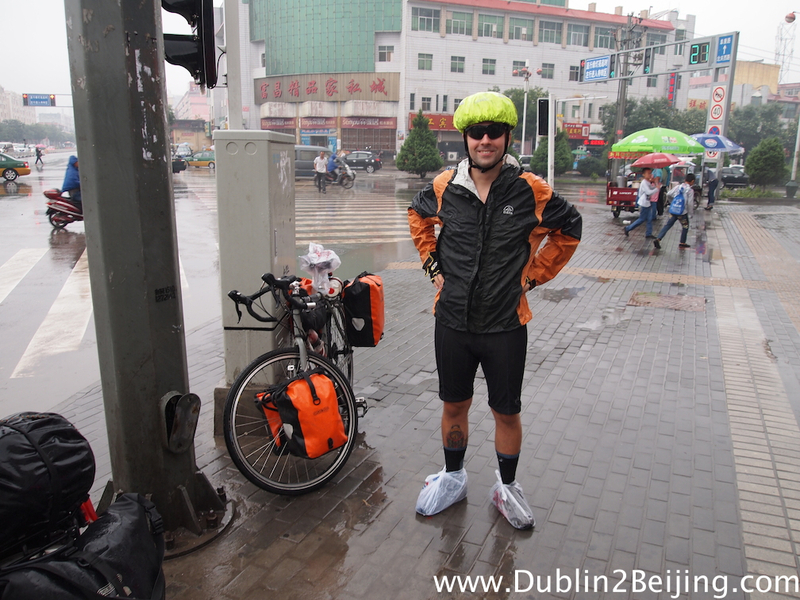 This entry was posted in China and tagged cycel in china, cycle dingbian, cycle dublin to beijing, cycle ireland to beijing, cycle jingbian, cycle nanxia, cycle shaanxi, cycle to Beijing, cycle to China, cycle touring in China. Bookmark the permalink. 9 Responses to Nearly There…. As ever, an incredibly uplifting read! Good look with the final leg, I’ll be sad for it to come to an end. Must have had so many great experiences! Pedal-on!! Steve, you’re going to do it. You’re a fecking hero. Well done.What an epic journey and experience.I can’t wait to meet you and shake you’re hand. You’re the man. This is by far the best blog on my reader! Keep peddling. Wow!! Nearly there. Peddle on hope u can Skype sat for yr mams coffee morn and we will cheer u on for last kms. Unbelievable what u have achieved. Go Stephan go!!!! Well done Stephen, I’ve been following your progress from the start and what an inspiring journey it’s been. Keep those pedals turning, won’t be long now!